The set is in perfect condition with ‘ASRO‘ and an elephant with a man on it’s back included in the basemark. I would like to know more about it if anyone can help. Firstly ASRO is most probably the pattern or design name. 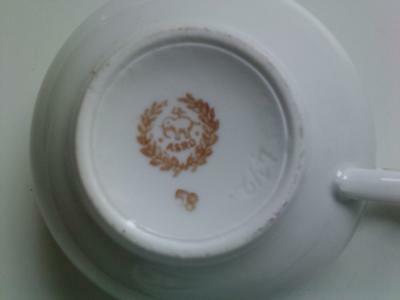 Wreath marks are quite common on Japanese wares and often attributable to Noritake and this ASRO china may or may not have been manufactured by the Noritake company. Noritake have used more than 400 marks in their history. You could also look at Moriyama Mori-machi and Nippon Yoko Boeki Co. Elephant marks can sometimes be attributed to the Tashiro Shoten porcelain shop in Yokohama. They did use an Elephant head circled in a wreath and their products included Trico, Trico China and Royal Trico. Other Elephant marks are associated with the Silesia Earthenware Works of Breslau, Silesia and an American company called the Steubenville Pottery Co of Steubenville, Ohio who use an Elephant stamp on their Ivory Ware. ASRO Germany mark by: John M.
There’s a question about this mark on the ebay pottery board. It shows the word GERMANY over the mark, in the same red ink. Does anybody know the company that makes the ASRO design? Wh are ASRO by: Neil P.
Which company makes the ASRO china designs?